I realize that this picture is not perfect or really that beautiful- it was taken on my phone, moments before I dressed this salad. 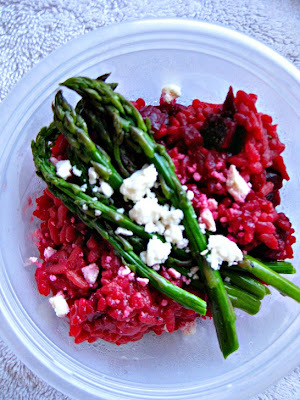 I just wanted to share this recipe and didn't feel I could without some sort of picture! 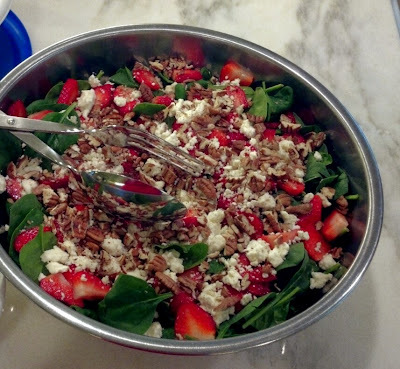 We had our good friends over for dinner about a week ago and my friend brought this delicious spinach salad. I usually don't really like salads with sweet dressings, but the balsamic vinegar in this one balances it out. We had a family dinner for my son's birthday and I decided to remake this salad and take it along. I used 3x as much spinach, but just doubled the dressing. It is a perfect addition to any meal and since we have delicious strawberries in season from Florida here, it is the perfect time of year to make this salad. A few weeks ago, I had some sour cream I needed to use, so I decided to make muffins. Usually when I make muffins, I completely "healthify" them by using whole grains, less sugar, low-fat buttermilk instead of oil or full fat dairy, etc. It's just something I do. Well, I decided to leave these alone and just make them as is. It was hard for me to do! I mixed up the batter on a school night and the crumb topping too. I put the batter in muffin tins, covered them with plastic wrap, and let them sit overnight. When I woke up the next morning, all I had to do was apply the crumb topping and pop them in the oven. I resisted the urge to try one, but my kids loved them! So did my husband. Who doesn't like eating cake for breakfast?? 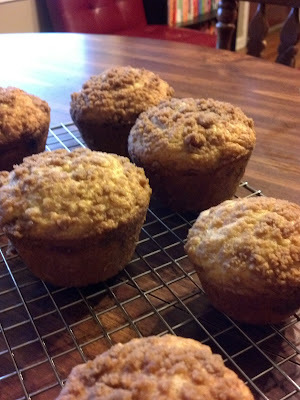 It feels repetitive to say that I have made everything there is to make with overripe bananas, but that is how I feel. It happened again and I realized I had never tried Ellie Krieger's version of banana bread. Her original recipe called for pecans, but a few people in my family don't love nuts, so I left them out. 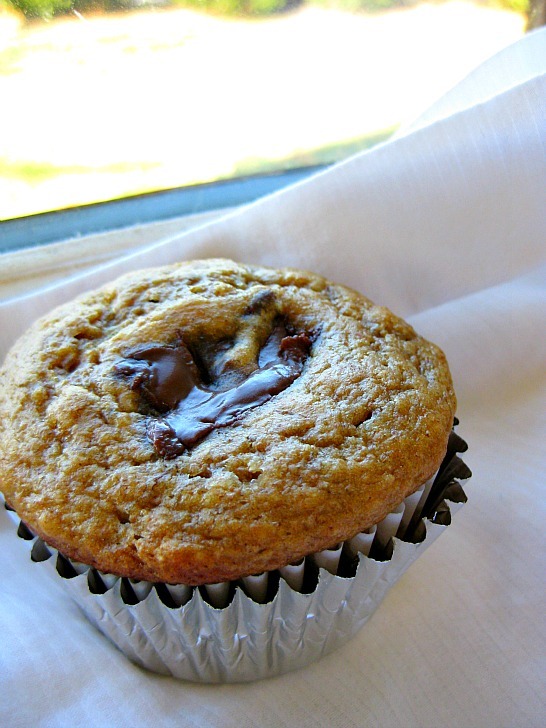 I decided to put a dollop of Dark Chocolate Dreams in the center of the muffins, just to make them more exciting. This was a great banana muffin and we enjoyed them very much! Whisk together dry ingredients (flours, sugar, baking soda, baking powder, salt). Whisk together wet ingredients (yogurt, oil, eggs, and vanilla. Add bananas. Stir wet ingredients into dry ingredients, and stir in toasted pecans. Pour the batter into loaf pan sprayed with non-stick cooking spray, and bake in 350 oven about 50 -55 minutes. Cool on wire rack before slicing. Or if making muffins, put in a muffin tin, lined with cupcake/muffin liners and bake for 18-22 minutes. I love making soup. It is one of my favorite things about the colder months. Nothing is more comforting than a warm bowl of soup on a cold night. I made this soup the day after New Year's, since I live in the South and it is good luck to eat greens and black-eyed peas to start off the New Year. ( We were traveling home on New Year's Day). My husband tried to tell me that it didn't really count since it was the day after New Year's, but I hope we have good luck anyway. 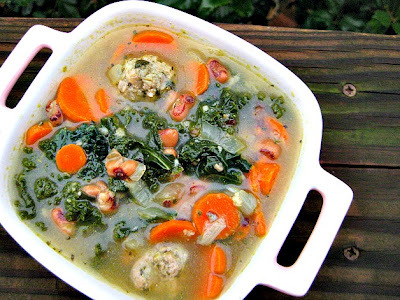 I was able to pick the kale for this soup out of my garden. Even now the Swiss Chard and Kale are going strong! 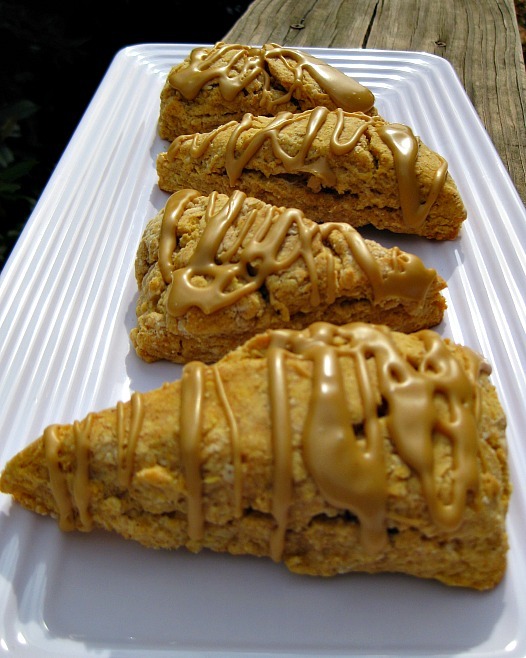 These pumpkin scones are one of the best scones I have ever made. It's kind of embarrassing that I made them back in November when my brother and sister-in-law were here visiting and I haven't gotten around to sharing the recipe. Again. I shared this recipe a couple of years ago too, but they are just so good, that I had to share it again. These scones have the best texture and I always use the ginger molasses icing, which gives a nice spicy touch to them. Our visitors loved them and I was reminded once again why they were a favorite a few years ago! This picture is actually what I did with the leftover chicken I had from making the crockpot recipe below. I also made the taquitos, but didn't get a picture of them. We enjoyed the Lettuce Cups and Taquitos, but I wanted to do something different with the rest of the chicken. I decided to make a quick pizza and top it with carrots, cilantro and chopped peanuts. I also made a quick slaw with shredded cabbage, carrots and a peanut dressing. 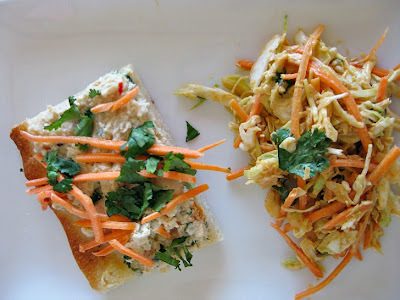 I did make the peanut dressing listed with this recipe when I made the lettuce cups and taquitos, but I froze the chicken, so I had to make a different peanut sauce when we had the pizza and I didn't really follow a recipe. I just mixed one up and it worked perfectly as the dressing for the slaw. Place chicken breasts in the crockpot. Pour coconut milk on top and season with salt and pepper. Cook on high for 4 hours. Let the chicken cool and shred- it will be very soft. In a large bowl, stir to combine roasted chopped peanuts, garlic, lime juice, cilantro, green onions, fish sauce and ginger. 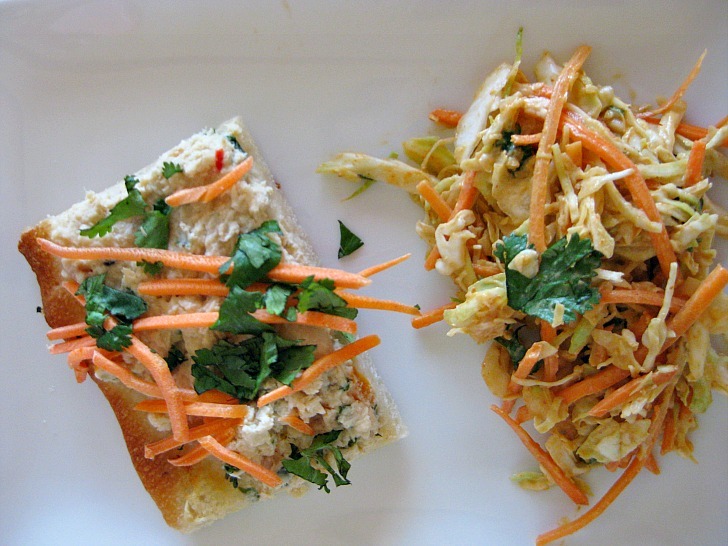 Fold in shredded chicken. Taste and add any salt and pepper if needed. Store in the refrigerator until ready to serve. Serve the chicken filling with lettuce leaves, cilantro, limes, bean sprouts, chopped red pepper and the peanut sauce for drizzling. In a medium bowl, whisk peanut butter, soy sauce, honey, rice vinegar, red curry paste, lime juice, sesame oil and fish sauce. It may seem “curdled” at first, but continue to whisk and it will come together as a smooth sauce. If you would like a thinner sauce, add 1 tablespoon of water at a time and whisk until you reach the desired consistency. Spoon into a bowl, top with peanuts and drizzle over the lettuce cups. This is another recipe that I saw a long time ago and I wanted to try. I like making my own snacks for our family that use dates as the base. The recipe also includes prunes. 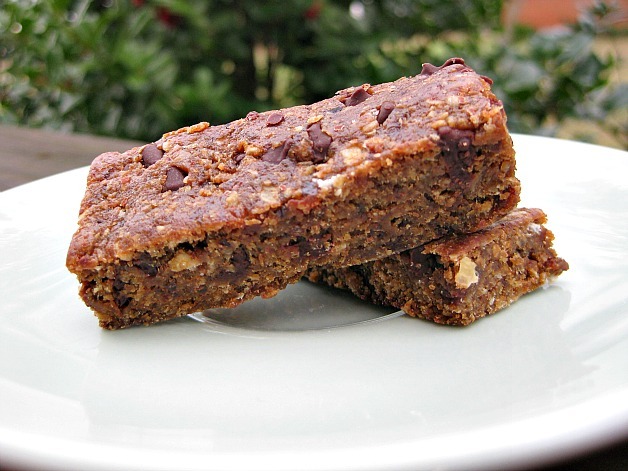 These types of bars make me feel better nutrition wise because the source of sugar is natural and not refined. I'm not saying that we never use normal sugar, but I like using natural sources as often as I can when making treats. These were easy to mix together and I ended up freezing them once they were cut into bars. My son and I enjoyed them quite a bit straight from the freezer. 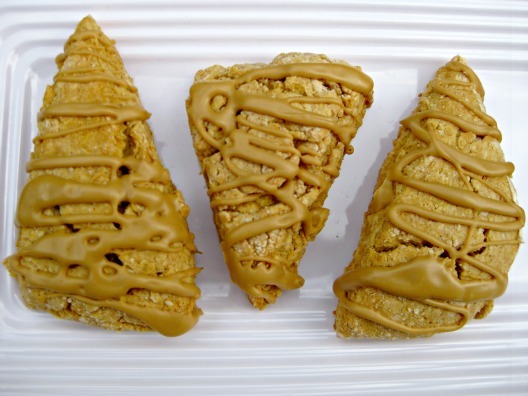 These will definitely be made again and again. Sometimes I wonder why it takes me so long to make a recipe that I see online when I really, really want to make it as soon as I see it! Such is the case with this recipe. I saw it here over a year ago and thought it looked so fabulous. 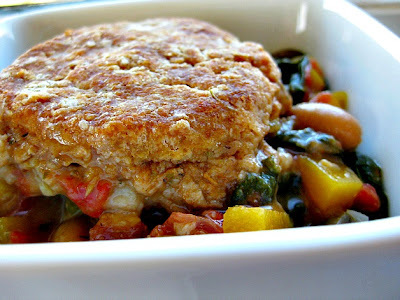 I love Minestrone, especially the one that my Mom makes, and I thought the idea of placing biscuits on top was awesome. It was quite dark the night I made this, so I didn't get a shot of the entire dish, but I did take a quick picture of the leftovers, which I enjoyed for a few days after we made this. My 6 year old helped me put this together and she made the biscuits almost all by herself. This is a very comforting dish for a cold night and tastes great as a hearty lunch if you are lucky enough to have leftovers. 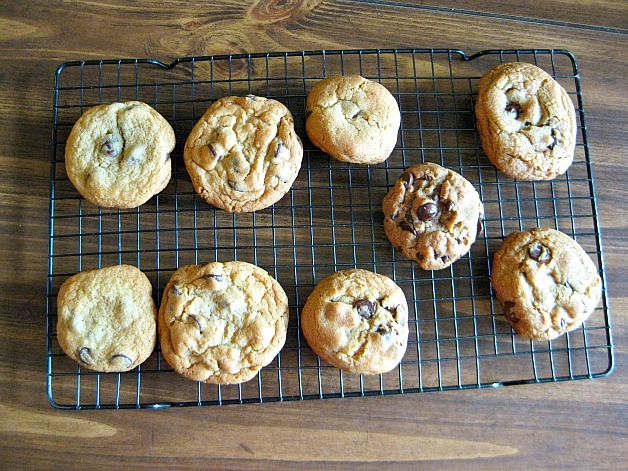 Chocolate Chip Cookies, left to right- Martha Stewart's Soft and Chewy, Cook's Illustrated The Perfect CCC, Alton Brown's The Chewy, (the random one in the middle was a whole wheat variety that used oil that was not good enough to even be in the running) and The New York Times CCC. My son decided he wanted to do a Chocolate Chip Cookie science project this year. He wanted to find out which variables make the chewiest chocolate chip cookie. We did some research and found 5 recipes that we wanted to test. Some used bread flour, cake flour, an extra egg yolk or melted butter. Some required chilling the dough in the refrigerator for a specific amount of time. We mixed up all the doughs on the same day and had 4 taste tests. Of course, since all people have different tastes and things they like about cookies, the reviews were different each time. The first time, CI'S Perfect CCC was the overall winner in chewiness and taste. The next time it was a tie between Martha Stewart and Alton Brown's The Chewy. The last time we taste tested, the majority of the tasters liked Martha Stewarts cookie the best. I am not a huge fan of Chocolate Chip Cookies, but I enjoyed CI's cookie the best. I thought it had the best flavor and texture. My husband loved The Chewy. My kids all liked different ones better than the others, so the problem was never resolved! The good news is that we now have about 100 CCC dough balls in the freezer, for a quick snack whenever we might want one!